Diane H. Cornell has over twenty years of experience in civil litigation and administrative law. Diane practices in the areas of civil litigation and insurance defense focusing on trucking and employment law. 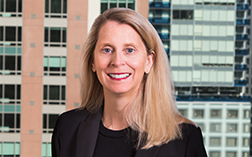 Prior to joining Betts, Patterson Mines P.S., she worked for a premier Pacific Northwest law firm handling construction defect, work place injury, products liability, automobile, trucking, premise liability and fire loss cases. Diane was also an Assistant Attorney General for the State of Washington in the Labor and Industries Division. As an Assistant Attorney General, Diane prosecuted work place safety, fraud, industrial insurance audit and regulatory compliance cases and defended workers’ compensation, third party and crime victim’s appeals.